Print your logo onto these custom printed panda eco bamboo notbooks or one of our other innovative eco and use them in your next marketing campaign as a unique giveaway item. Panda Eco Bamboo Notbooks can be laser engraved or printed and are a great eco friendly bamboo cover notebook with an elastic retaining closure and 80, 70gsm recycled lined pages which come spiral bound. These are a great Eco option and are visually beautiful. Laser Engraved: 65 mm x 70 mm extra $2 per item. Prices shown for 1 Colour Print, 1 Position. **Minimum order quantity is 25pc, please add $2 to the 50pc price. This quick turnaround promotional item can be produced within 2-3 days - rush fee of $0.60 per unit applies. Custom brand these bamboo tote bags (short handle) or one of our best-selling promotional eco with your company logo! 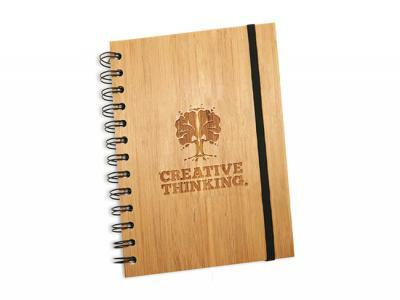 Personalise your panda eco bamboo notbooks or custom design eco for your marketing campaign. How can these unique promotional panda eco bamboo notbooks or our personalised eco fit in with your marketing strategy and help you maximise your brand exposure? Our custom made Panda Eco Bamboo Notbooks can be produced from a minimum quantity of 50 pieces. We can have your logo branded on these corporate Panda Eco Bamboo Notbooks. A setup fee of AU$180.00 will apply to make the film.